If you are unsure how to participate in Twitter chats, this guide is for you. Let’s start by offering an analogy. Imagine Twitter as a huge conference where anyone can attend. Normally, a conference includes breakout sessions, each of which covers a specific topic. You can think of a Twitter chat as a breakout session where conference attendees gather based on their affinity for the topic being discussed. Conference breakout sessions are usually defined by a descriptive title which serves to help attendees to plan which session they want to attend. Similarly, Twitter chats also have a title, although, due to Twitter’s character limits, the title looks more like a secret code language rather than a descriptive title. I addition, this code language is preceded by a pound sign “#” to make up what is commonly known as a “hashtag”. If you want to participate in a Twitter chat, you have to find the associated hashtag. The timing really depends on the organizers of the chat, but most commonly Twitter chats are held either on a weekly, bi-weekly or monthly basis. The length of a chat is normally for a period of 1 hour, although I have seen some troopers who host “all day” chats on a specific day of the week. As mentioned above, every Twitter chat has an associated hashtag. To find Twitter chat conversations of your choice, just search Twitter using the hashtag as a keyword. When you do this search, Twitter gives you search results in a variety of flavors. If you want the most popular tweet for the chat, look in the “Top” tab. To view the latest tweets in the chat then focus on the “latest” tab. If you decide to attend the chat while it’s happening, it is best to focus on the “latest” tab. Networking– The host usually starts the chat sharing some information and everyone starts discussing the topic, or ask questions. This type of chat is not very structured since most of the time, everyone does their own thing, but lots of networking happens. Host switches to Question 2– Q2- How can we help journalists become better at representing what we do? Attendees answer: A2– We need to teach them how science actually works! Presentation followed by Q and A– This type of chat involves the host giving a presentation and then opening up the chat for questions and discussion about what was discussed during the presentation. You may be wondering how a presentation during a Twitter chat would work. This really depends on the host. The presentation may be in the form of status updates, which may or may not involve images or Gifs. Being an active listener– This is probably a good thing to do if you’ve never attended a Twitter chat and want to get the feel of how it works. 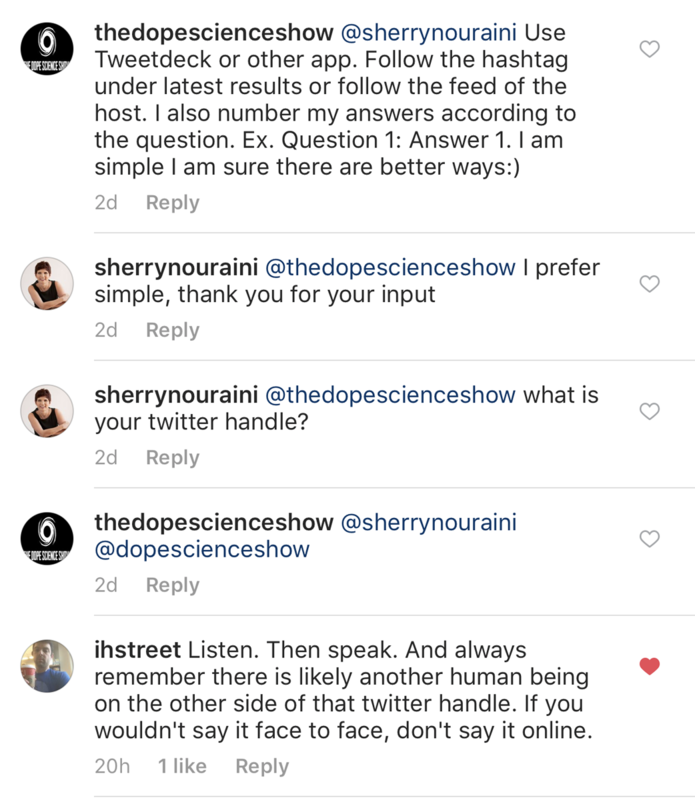 Being an active listener follows a workflow that looks something like this: reading what the host or other participants are sharing -> choosing the ones you and your followers would find useful – > “loving” and retweeting them. Participating in direct conversation- when joining a chat, you can choose to contribute to a conversation thread that is already happening, or just address a particular individual. To do the latter, click on the conversation bubble icon right beneath a tweet and start typing, making sure to include the hashtag for the Twitter chat. Participating in a thread- Conversation threads are connected by a blue line on Twitter, and number of conversations in a thread is indicated by nummerics right next to the little conversation bubble icon. To participate in any conversation thread just click on the conversation bubble and start typing. You can see who is part of the conversation by checking Twitter handles listed on top of the status box window. To make sense of all of this, and learn other tips for navigating conversations, view this short silent video. Be sure to view in full screen and click on the cogwheel on the bottom right corner to choose HD for high resolution. Tweetdeck is a freely available social media management tool owned by Twitter. Visit Getting Started with Tweetdeck for instructions on using this tool. Tweetdeck allows you to view and manage multiple tabs from your Twitter profile in one dashboard. You can also view and manage a Twitter chat stream. 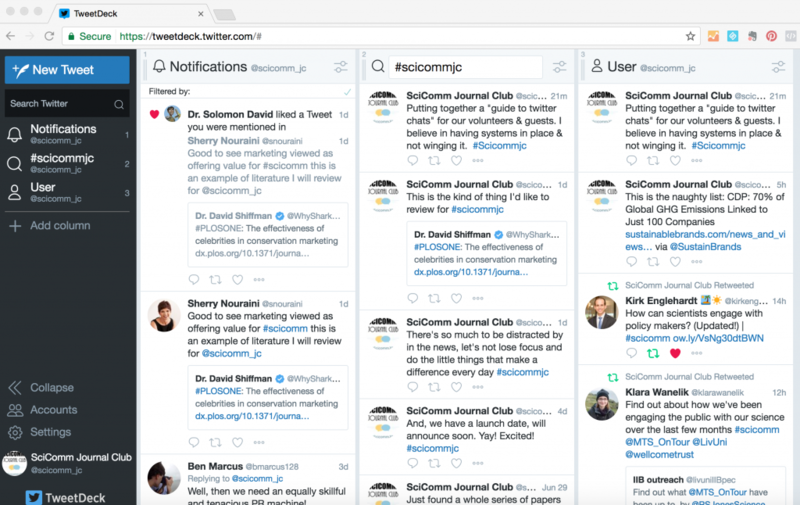 Below you can view a screenshot of Tweetdeck where three columns have been setup to monitor Notifications (left), a chat stream (center) and updates from a user (right). Interacting with the Twitter updates work the same way as in the Twitter web interface. 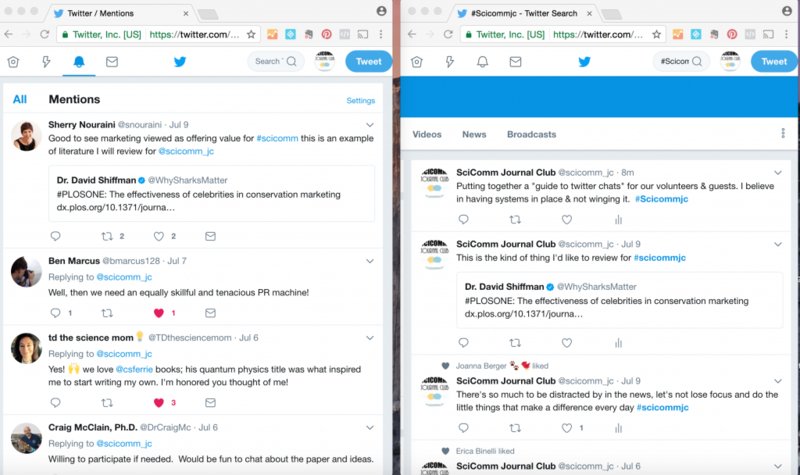 Another option for keeping up with Twitter chats is by opening multiple windows on your browser if you prefer the native Twitter web interface. In the screenshot below, one browser window shows the notification tab (left) while the other is a Twitter search results page, where the viewer is choosing the “latest” tabs (right). The advantage of using a search results page on the Twitter web interface is the hashtag automatically populates in the status box when you use the “Tweet” button to contribute something to the chat. Sometimes it is difficult to remember to include the Twitter chat hashtag between all that is going on. Glad you asked. To answer this question and also share tips by other experienced Twitter users, we solicited input from the Twitter community, and they sure did not disappoint. Click on each Twitter embed to see more, as some generous peeps like @Purplelilac shared their wisdom in more than one post. Don't only post or answer questions try also to write your own opinion about the subject under discussion. Mark your calendar weekly or monthly and try to attend as much as you can. The more you attend the more familiar you get. Engage with others (don't just answr Qs), I find easier to follow when on hosts page rather than following # . If late, that's okay! Threaded convo (such as this one) that goes off main chat is fine. I've seen ppl do orig tweets w/ just the hashtag, & that's confusing. RTs are great when you want to share message/post, but not good for social interaction. Use for things you want to share with followers! Don't sit out just because you can't take part in the entire chat. You can learn a ton and make connections even in a couple minutes. Proofread, have clarity, and be brave! Go slowly, you don't need to keep up with the pace of the feed or you'll miss stuff! Also, retweet and respond to your favorites! We’d like to thank @Dr.MrsT for tagging their friends for input. Hi @cristinarigutto, can you suggest any hints and tips? We hope this guide has been useful. 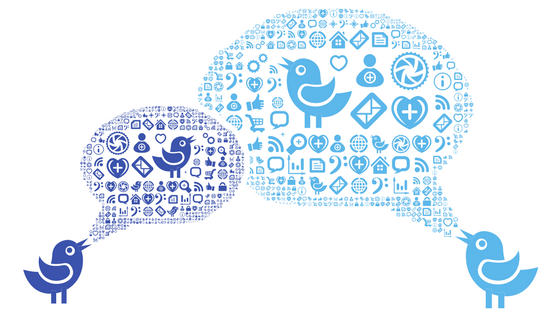 Please don’t hesitate to ask questions or share your own wisdom about Twitter chats. We’d love to hear from you.